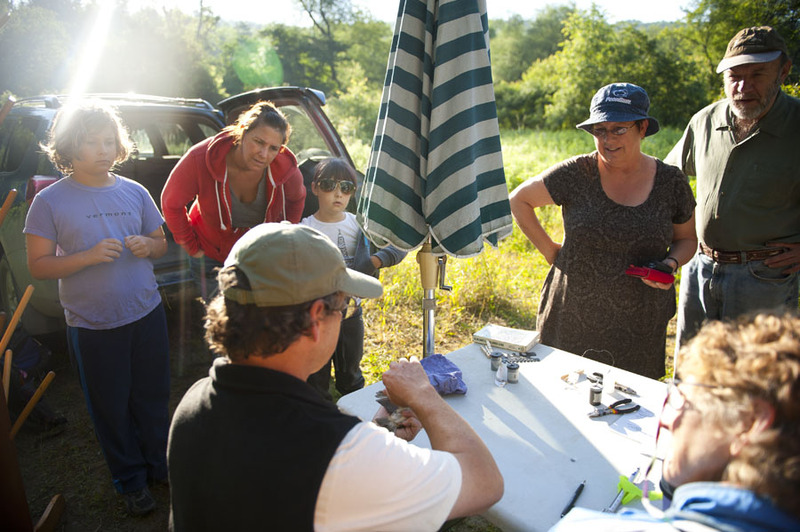 The sun was just barely up last Saturday morning and already a small group of people was hard at work, opening up mist nets, and preparing a data collection station at the North Branch Nature Center in Montpelier. 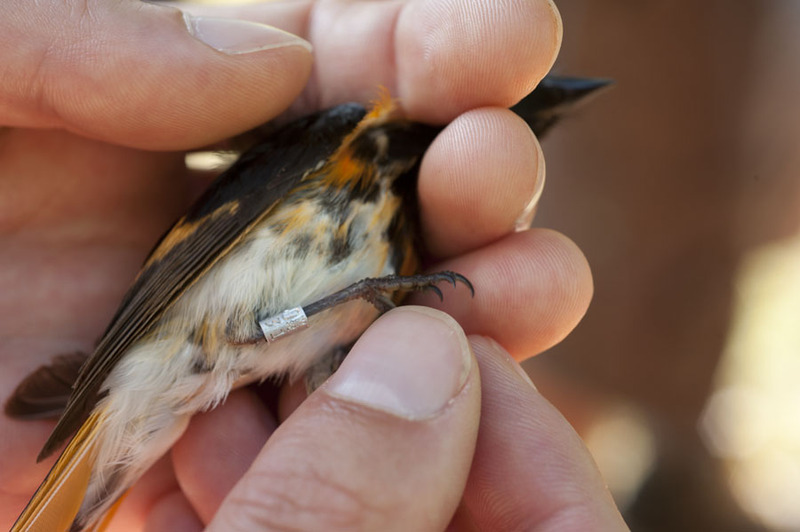 Their goal, to collect data that will help to monitor bird populations continent-wide. The data collection period requires several days of sampling during breeding season, typically May 1st to August 8th. The process is called Banding and during this particular Saturday session, the banders at North Branch Nature Center offered a public demonstration so that people could learn about the birds and the banding process up close. The day starts with opening mist nets that will be checked at regular increments throughout the day. These nets, spread out across the nesting territory, are intended to catch birds without harming them so that the bird banders can collect the birds and bring them back to a central banding station for analysis. At the banding station the scientists are able to record information that leads to conclusions about the birds age, gender, health, and nesting status. Particular observations and measurements include weight, wingspan, molting and plumage, flight feather wear, body fat, and brood patch among other things. Many of these observations can only be made by having ‘a bird in the hand’, this provides a huge advantage to the scientists wanting to learn about productivity and survivorship of a species. Of course, process concludes with birdbanding’s namesake, the bander attaches a small metal numbered band to the leg of the bird. This allows scientists to gather information about and track individuals. All of this information is contributed to a continent-wide database called MAPS (Monitoring Avian Productivity and Survivorship) a program organized by The Institute for Bird Populations. Chip Darmstadt, is the Director of the North Branch Nature Center and ‘Master Bander’ he says that about half of thebirds the Nature Center catches have already been banded. Tracking individuals allows banding stations like the one at North Branch to watch as the same individuals return year after year. At the North Branch Nature Center the bird banding station is part of their rather unique Youth Birding Program “Feather Questers”. “There are a lot of Ornithology programs out there, like the Audubon Society,” explained Larry Clarfeld, the Youth Birding Program Coordinator on the way to check mist nets, “but we offer a program to learn about birds that is kid-friendly”. Larry then spent the next few minutes untangling a Common Yellowthroat from a mist net while engaging a small group of visitor with an explanation of how the birds become trapped in the net and how best to free them. The visitors at the public bird banding demonstration were people of all ages, from as far away as Connecticut, but perhaps the most enthusiastic and most engaged onlookers were a small group of kids who had participated in the Youth Birding Program and returned to show their families a little of what they had learned. Once back at the banding station the kids and their families rummaged through field guides under the guidance of Clarfeld, Darmstadt, and others trying to identify the birds based on their markings. The excitement, not to mention the problem-solving and critical thinking, was palpable as the group narrowed in on a species identification. It was a rare treat to see these birds close-up and to learn about the efforts being made to track their productivity and survivorship. 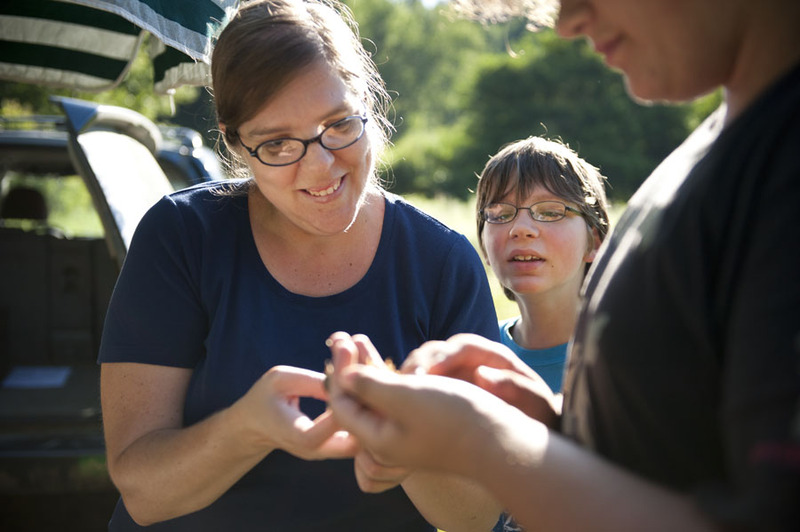 With the enthusiasm and knowledge of scientist-educators like Darmstadt, and Clarfeld it is easy to see how the youth develop a passion for nature so strong that it leads them to drag their families out into a field at 7:00am on a Saturday to learn about birds. 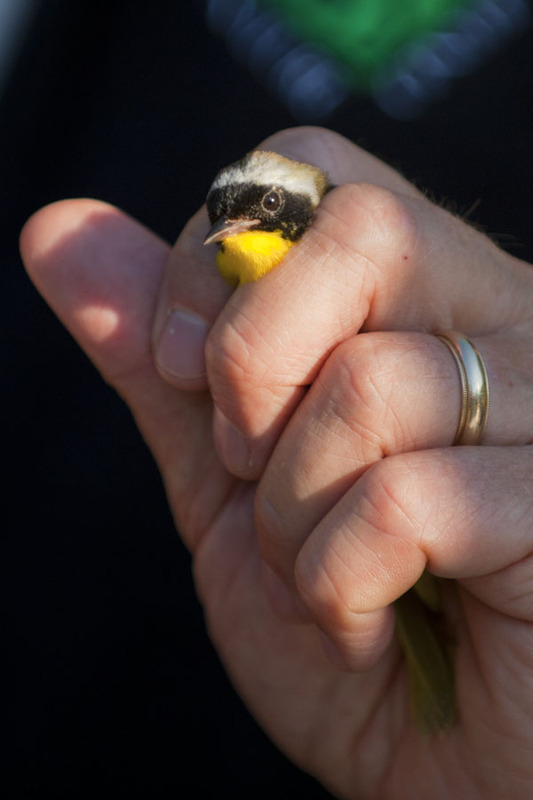 Chip Darmstadt, director of the north branch nature center and ‘master bander’, holds a Common Yellowthroat in what is called the ‘Bander’s Grip’ holding the bird in this way allows the bander to make observations, collect data, and attach a tracking band without the risk of harming the bird. r-l Miles Launderville and Maya Fried watch Larry Clarfeld, Youth Birding Program Coordinator for the North Branch Nature Center, as he, takes a male American Redstart out of a collection net and places him in a bag for the short walk back to the banding station. The banding station can’t be too close to any of the nets because the risk of catching the same birds over and over againg would be too high. Larry Clarfeld, Youth Birding Program Coordinator for the North Branch Nature Center holds a male American Redstart showing the band, which carries a tracking number that will be entered in a national database. Chip Darmstadt, director of the north branch nature center explains to visitor some of the measurments and observations made during the banding process. Filed under Blog, Blog: Events, Blog: Nature. RSS 2.0 feed.